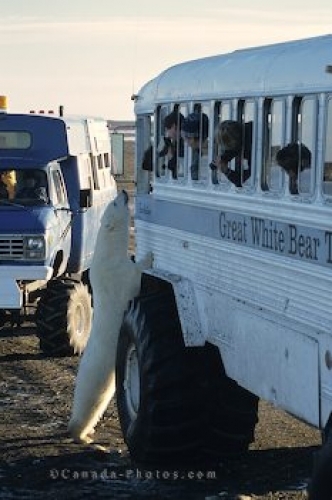 A polar bear looking at tourists on a bear watching tour with special buses. Polar Bear closeup: Lucky tourists on a bear watching tour - getting really close to the Polar Bears of Churchill in Manitoba, Canada. Photo of a polar bear (Ursus maritimus) near Churchill in Mnitoba, Canada.